At my seminars, a common theme dominates many fall bass angling questions: location, location, location. As we transition toward winter, inquiring angling minds want to know: Where will we find largemouths after the shallow-water bass bite ends? Indeed, despite high water levels across the region, lake temperatures are dropping fast. Frosts have arrived across the north country and are quickly moving south each morning. Time to readjust. High water won’t really affect fish locations if food and cover is present, and ample supplies of both still exist. During this final solid month of open-water bass fishing, I begin my hawg search at the first deep-water breakline. Green weed cover edges such as cabbage, milfoil, and coontail edges are key spots to check on that breakline. Electronics provide a great, fast way to locate weeds, so use this technology to your advantage. Inside turns also are excellent locations, especially when they contain weed cover and rocks. As for your presentation, always consider depth, retrieve speed, and lure choices. Include crankbaits, wacky-hooked plastics, plus jigs-and-creatures in your arsenal along with the classic, uniquely-American Texas rig. If using cranks, present them close to the bottom, and experiment with crankbait size, profile, color, and running depth. To cover more water, use alternate casting angles in correlation with steady boat control. Small finesse cranks casted with Fireline via a 7-foot-plus spinning rod and reel are arguably my most productive fall presentations. Cooler water slows the metabolism of fish, so try to spark reaction strikes. 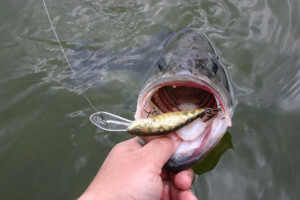 As water temps get colder, bass aggressiveness will decrease. Use extremely slow retrieves, and set the hook whenever you feel a tick. To avoid missing those ultra-light bites, I run the line over my thumb and forefinger, whether I’m using a spinning or baitcasting reel. A good year-round rule of thumb: After one bait catches a couple of fish in one spot, try a different bait to trigger a few more, and always remember that late morning and early afternoon can be one of the best times to catch fish. Fall fishing often produces big fish, but they demand that we work areas thoroughly. Some days bass will be on fire, and the next may require a ton of patience. Either way, it’s a beautiful time to be on the water. Patiently grind out fish by putting in your hours.